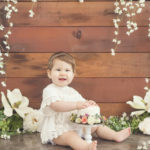 Sherman Oaks First Birthday Photography - Los Angeles based photo studio, The Pod Photography, specializing in maternity, newborn, baby, first birthday cake smash and family pictures. 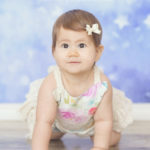 For this Sherman Oaks First Birthday Photography session, we got ambitious! And we had some fun! 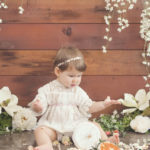 Mom and Dad had so many great ideas and a vision for this one year old girl’s portrait session, so we brought it to life! 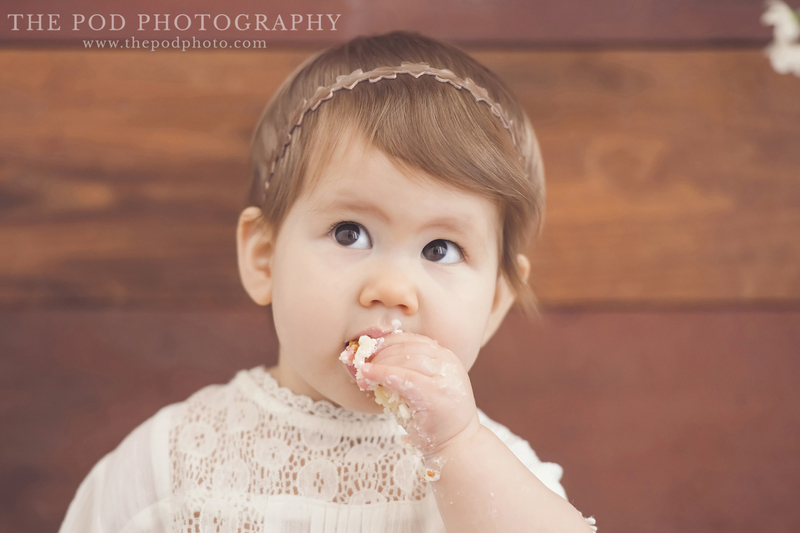 To start off with this darling girl, we wanted to do something sweet. 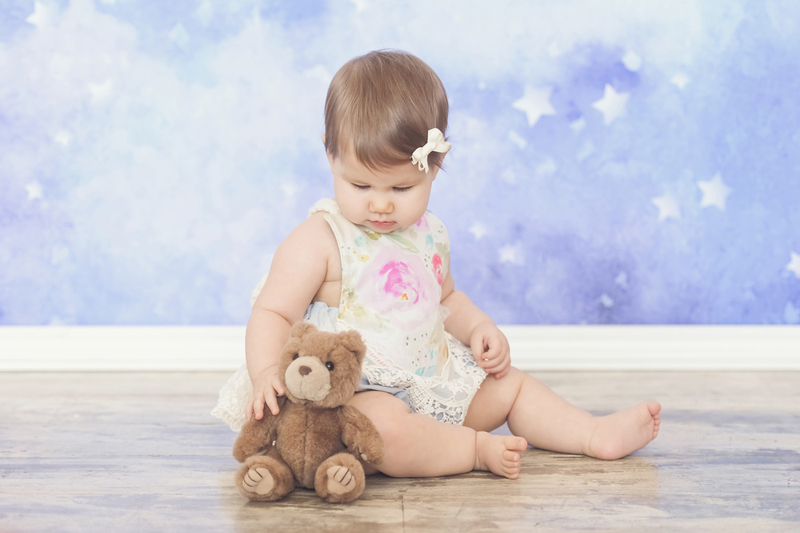 Mom absolutely fell in love with one of our most popular newborn shots that we do – our teddy bear night sky set. 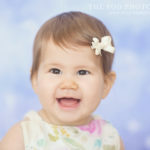 But since Miss Magnolia is 12 months old, we had to do it a little differently. 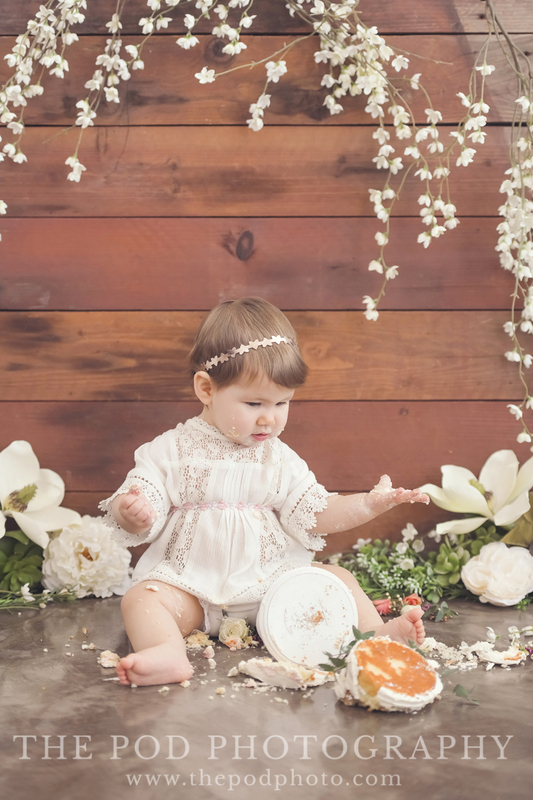 The floral patterned romper they brought in was perfect for this classic setup. 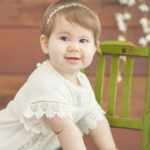 Plus her with her little bear is just darling! 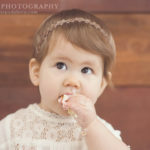 As cute as part one of this Sherman Oaks First Birthday Photography session was, part two was where it REALLY mattered. 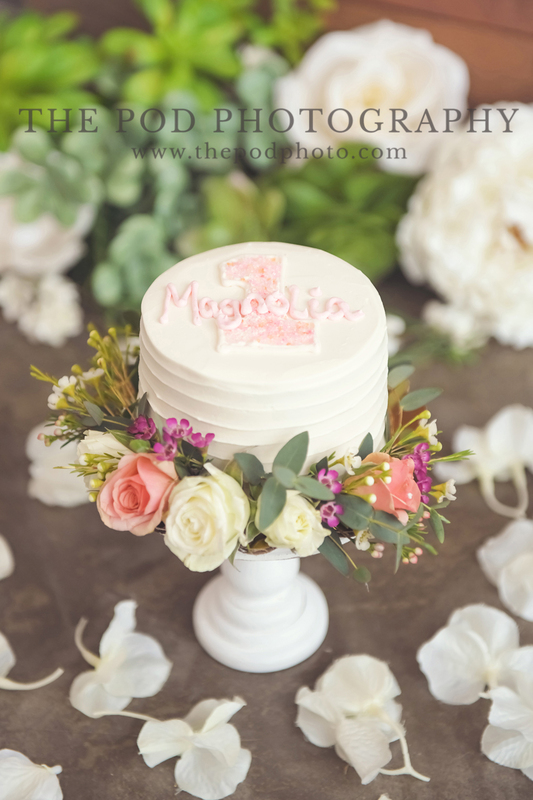 Being that this baby girl’s name is Magnolia, we knew we wanted to incorporate flowers into the shoot. Mom had a few over-sized Magnolia flowers she picked up from the craft store. And we had a variety of other white flowers and greenery to mix in. 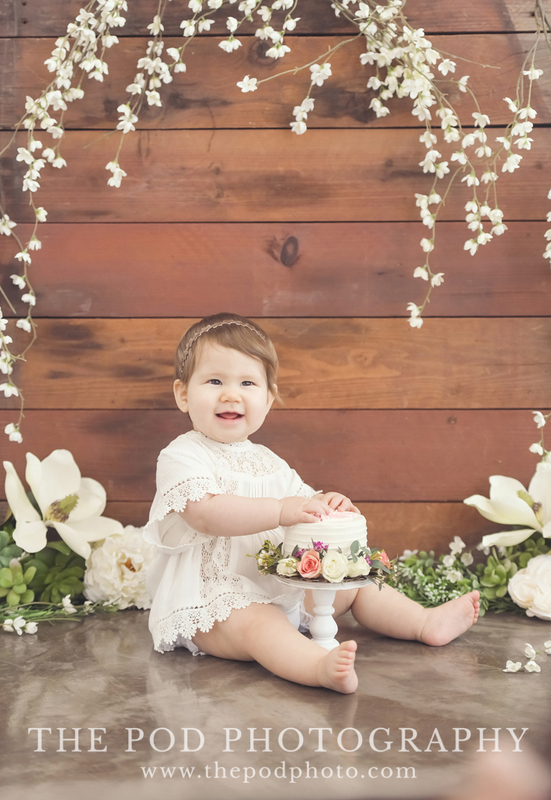 Together, with the white flowers, rustic background, and perfect smash cake, this Sherman Oaks First Birthday Photography session was a hit!! 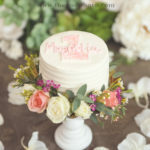 Our partners, Top Tier Treats, made us a beautiful smash cake with real fresh flowers that we were just drooling over! 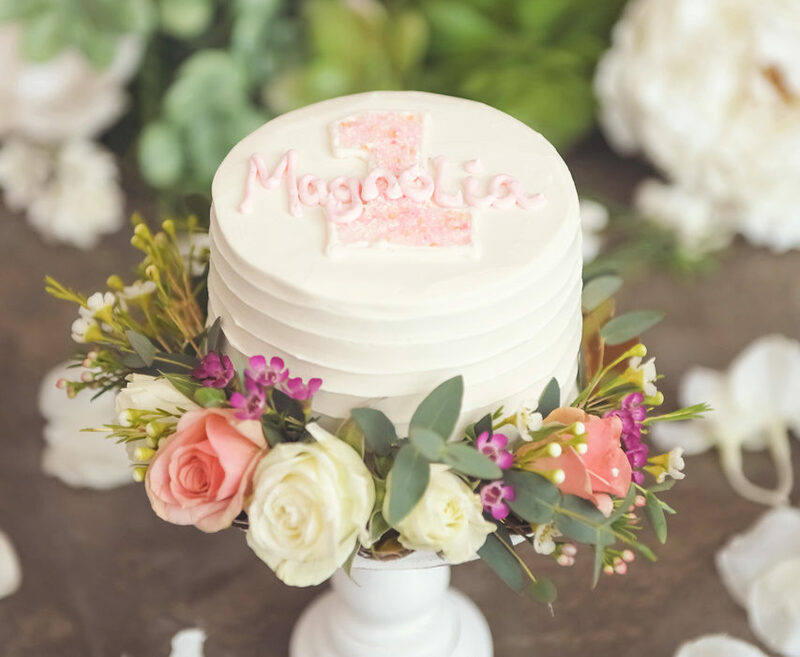 And Magnolia didn’t waste a second getting into it! 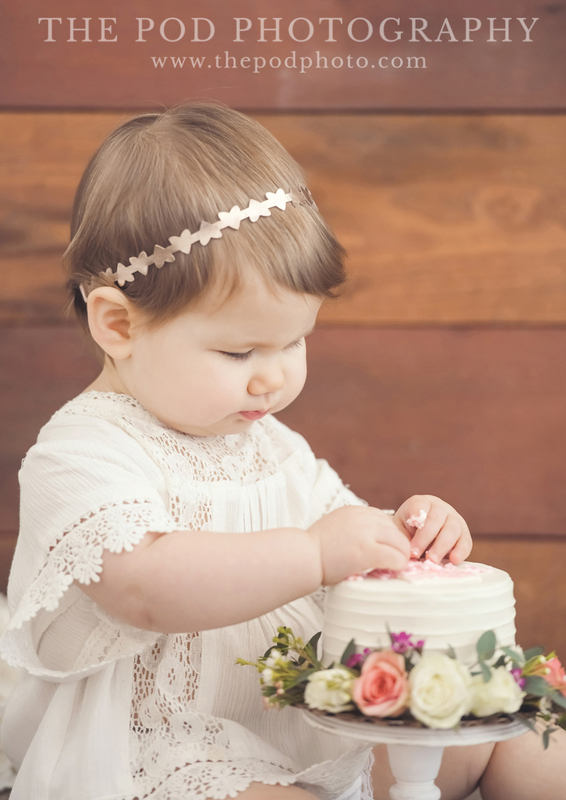 As soon as we gave it to her, it was hands (and feet!) all in! 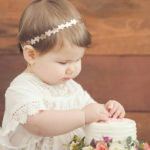 We loved how happy and excited she was smashing her first birthday cake! 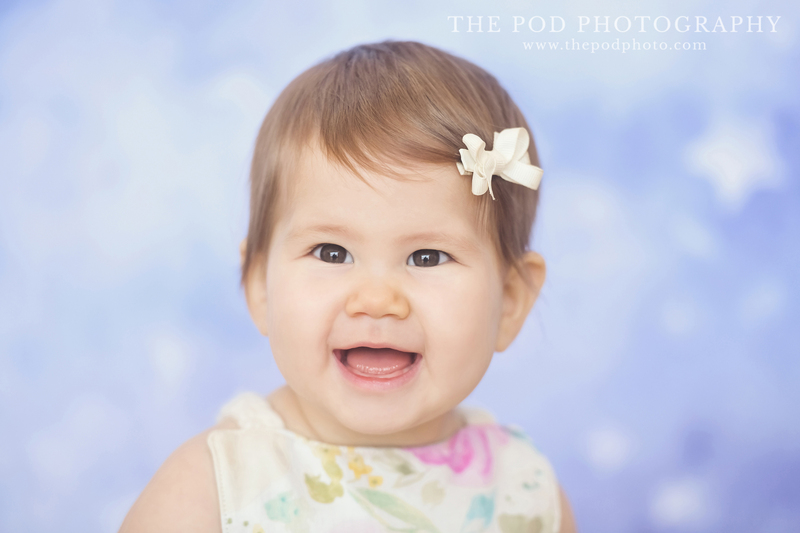 Magnolia’s cuteness did not stop there! 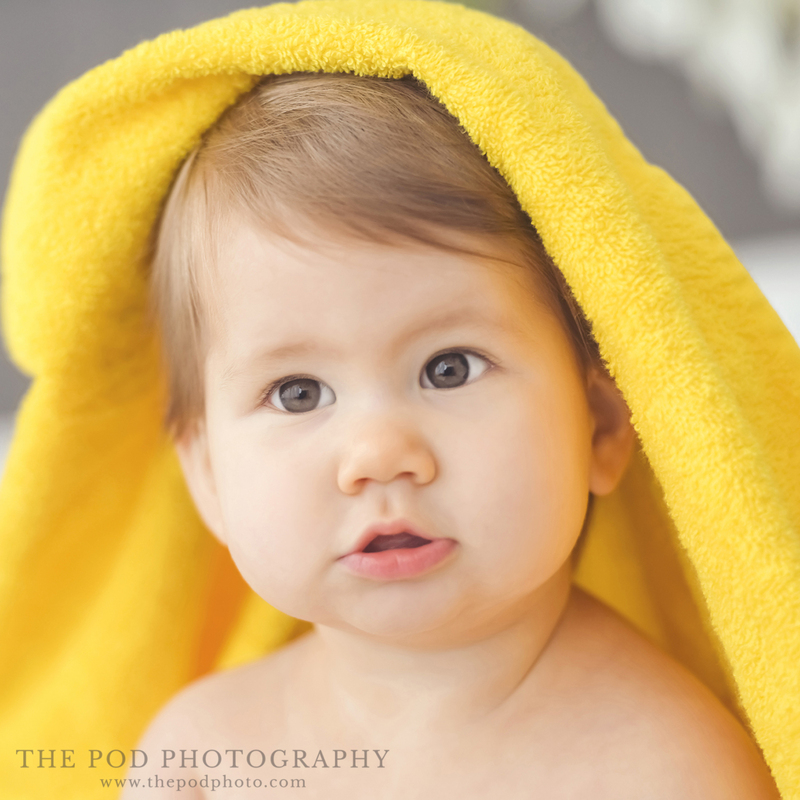 For her “splash” portion of her Sherman Oaks First Birthday Photography session, we went rubber-ducky overload! 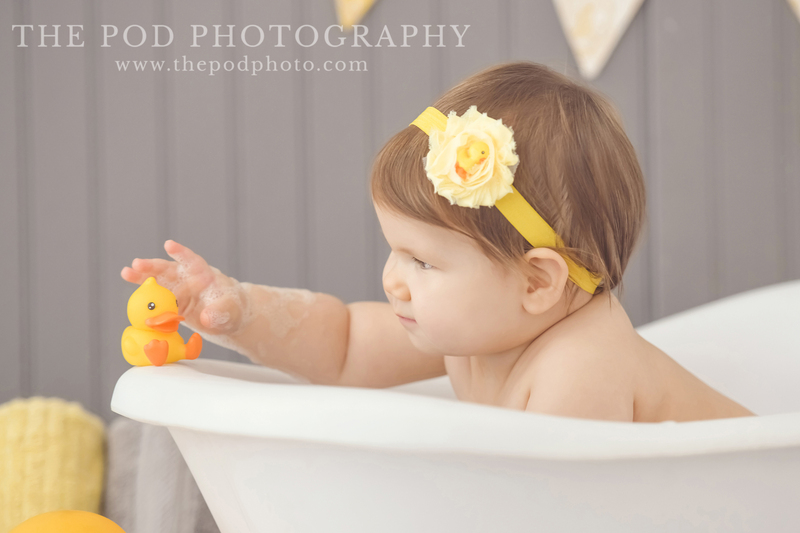 Magnolia LOVES bath time, and LOVES rubber duckies! 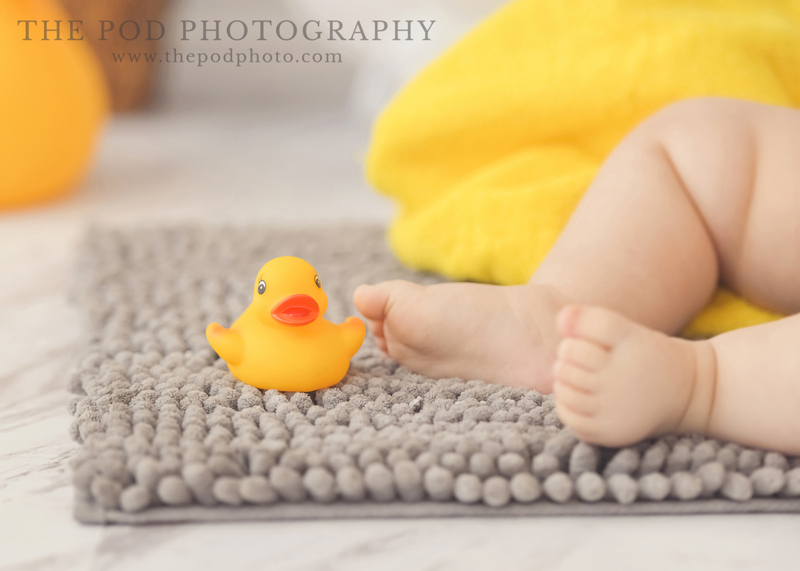 We have two little ducks here at our portrait studio, but we loved that mom brought in a whole bunch of different kinds of rubber ducks! 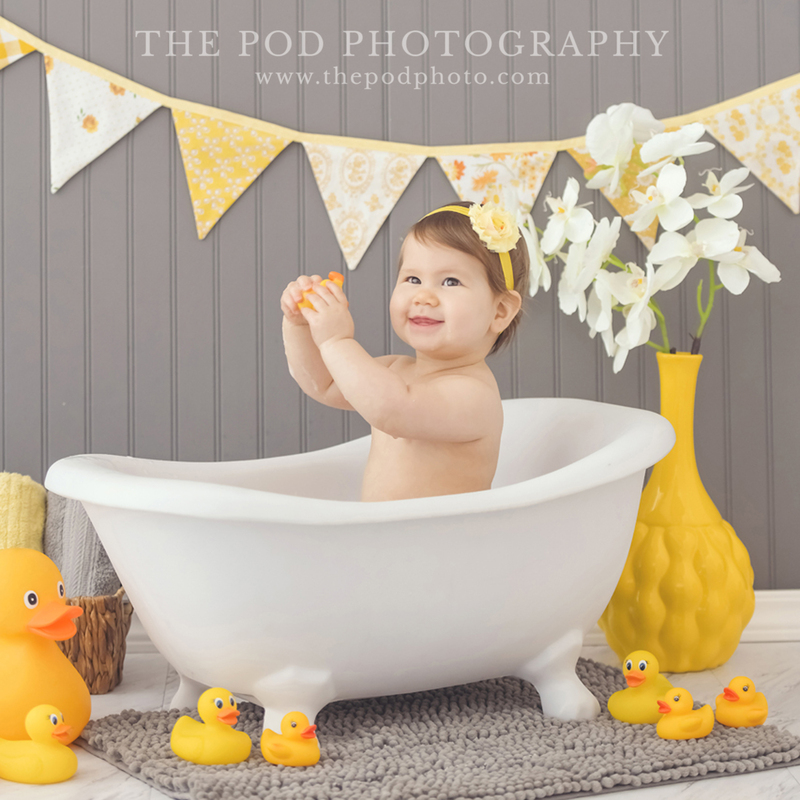 With the rest of the yellow bath accessories and her adorable headband, this set up was just darling! 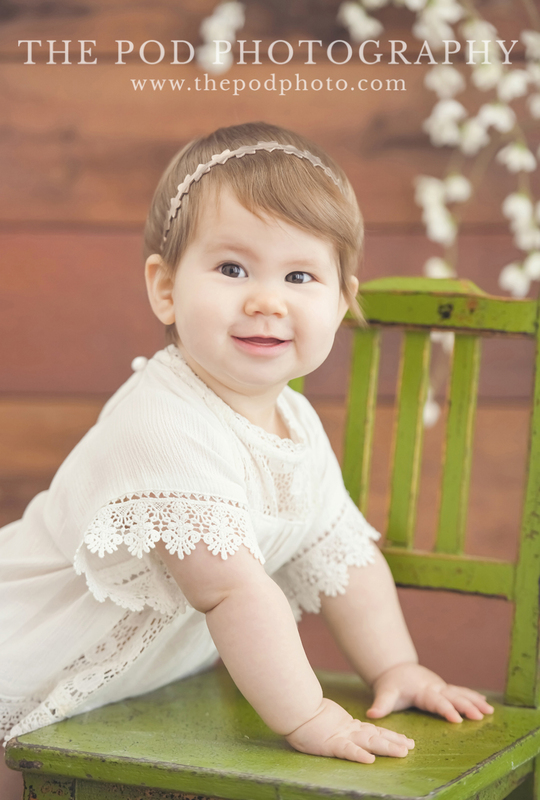 Her range of expressions made the whole shoot! 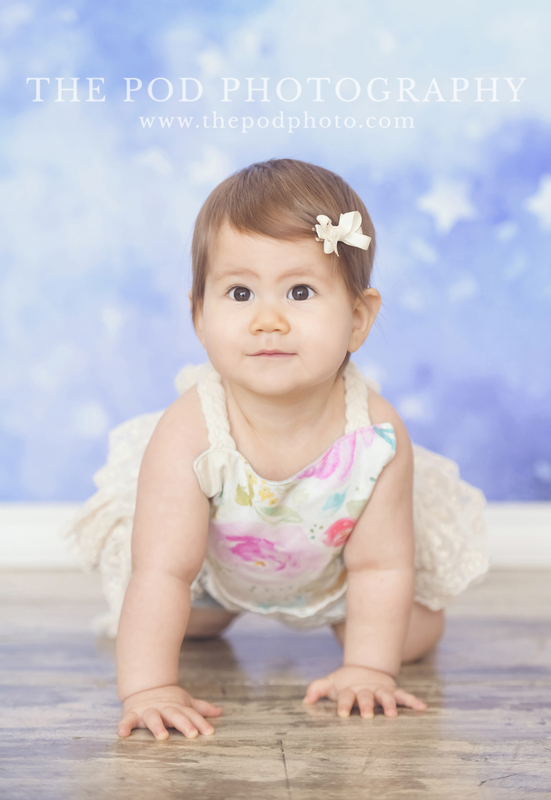 Give us a call at 310-391-4500 to set up a consultation with your Sherman Oaks photographer and be sure to follow us on our Blog, Facebook, Instagram and Google+ to see what we’ve been up to, or explore our YouTube page for more!